You are here: HomenextCity InsightsnextHave you got green fingers? 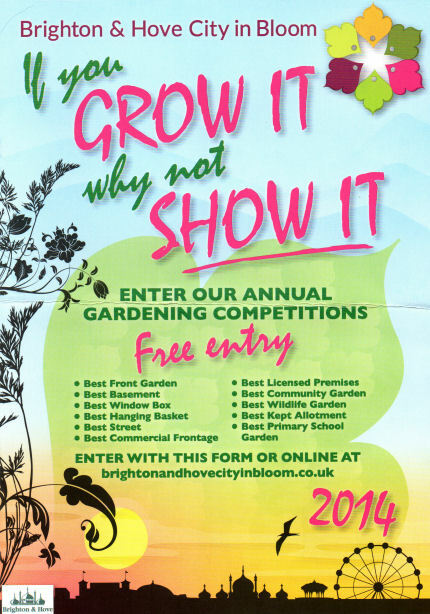 Brighton and Hove City in Bloom is a self-funded volunteer group which was launched in 2012. Their gardening competitions campaign brings communities, residents and business together to work to improve the environment of the city. They hope to make the city a more attractive place to live, work and visit. The competitions promote a sense of pride and bring together diverse sections of the community. But the group also extend their interests beyond just gardening; they draw attention to unsightly areas and work towards improving the appearance of localities. Experience has shown that this approach promotes a community spirit and increases civic pride. If you want to find out more about the objectives and work of Brighton and Hove City in Bloom group, or would like to download an entry form for the competitions, visit their website here.